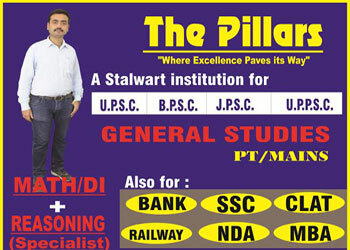 Best UPSC Coaching, UPSC Classes, BPSC Tutorial, Top IAS Preparation institute in Boring Road Patna Bihar – The Pillars Institute located at Verma Centre, near boring road crossing in Patna main city. We offer tutorial classes / coaching classes for union public service commission (UPSC) exams, bihar public service commission (BPSC) exams and staff selection commission (SSC) entrance exams in Patna. Other courses offered by us are Banking, railway exams preparation. You will find us as best upsc coaching in boring road Patna, best bpsc coaching in boring road Patna, best IAS coaching institute in boring road Patna, Top coaching classes for BPSC, SSC, Railway and Banking in Patna, Best civil services coaching in Patna, Bihar. You can enroll for UPSC exam preparation, BPSC exams preparation for session 2018 / 2019 at our institute. We provide best faculty and study material for other entrance exams preparation like Bank PO, Clerk, LDC and Railway. We are positioned at no. 1 in Top 10 coaching for UPSC, BPSC and IAS entrance exams. UPSC, BPSC and IAS exams are most prestigious entrance exams in India. Success in these exams are dream of lakhs of aspiring students but seats are limited and hence competition is quite tough. Exam pattern is also not easily crackable. You need best qualified faculty team and best teaching methodology in order to crack these exams. You need a proper guidance by experts either by them who already have cleared these tests earlier or by them who have vast experience in teaching with great success records. Hard labour with tips and tricks will definitely lead you to get qualified. The Pillars Institute in Boring road, Patna can assure you of your success in UPSC, BPSC, IAS Exams as we have huge success records in previous years exams. Come and visit our institute, meet our faculties, see our success ratio, analyze our teaching methodology and above all see the pattern. For any query you can call our counselors at 7544002776.